Early mornings in September are wonderful times for plein air painting. The air is calm and cool and the earth is still warm from months of sunshine. Then the magic happens. As the temperature of the ground decreases, it cools the air above it to the dew point (the point at which water vapor condenses into droplets of liquid water), forming a cloud of water droplets known as radiation. The ground is covered in thick dew. It's actually difficult to stay in bed knowing the weather conditions are right and the beautiful fog is there to greet me at the river. This particular time the fog was light and ready to break. Not long into the start of the painting I could see the sun at the edge of the trees. Correct values are once again the most important thing when painting and that includes painting fog when the values are all so close. In this scene the fog was in the distance and the grass where I stood was simply soaked with dew. As with any painting it is important to select your dominant color and orchestrate your color. The sky is where I look to find my dominant color. The beautiful melon sky can be made more lovely by the colors placed in the adjacent land and the moving from warm to cool in the actual sky. 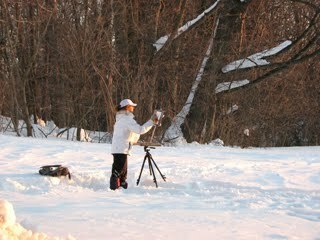 I have begun a new BIG painting that will be based on the plein air piece (at the top of the page.) Here is the underpainting...which I did in pastel and Liquin! On an entirely different and very exciting note....the groundbreaking for my new studio began on Thursday. Here is a picture of the way it looks now. 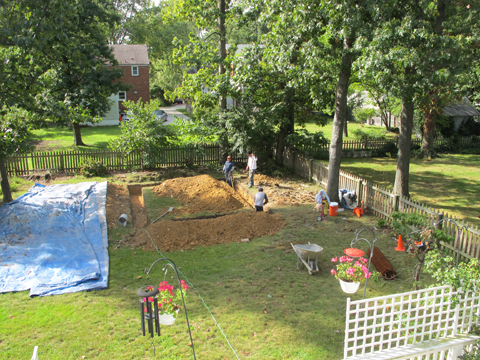 By Tuesday it will have footings and a concrete slab. Yay! This is my life-long dream and I still can't believe it is really happening! I will tell you more as it develops. You nailed this one with "the beautiful melon sky," Loriann! This will be a stunning large piece too! Your new studio looks great already, tucked in your own back yard. We are living in our "new" house but waiting for the new well to be connected to the house. When I'm done stripping miles of old wallpaper I will be ready to get my pastels out. A new studio! I am very happy for you, Loriann. Your painting is wonderful. Great painting! Pastel and Liquin...interesting. How is it different in effect from say, watercolor underpainting? Hearty congrats on your new studio!!! 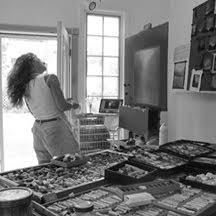 It's so important to have a studio that you like, hope you produce much great work in there. Oh, YAY! A new studio in your own backyard! Your own creative space! Do you already stand inside its footprint and try to imagine what it'll be like? QUICK! GO OUT AND PUT YOUR HANDPRINT IN THE CONCRETE BEFORE IT SETS UP!!! Also, put together a time capsule (a note, a sketch, some pastel sticks--whatever you want) to put inside a wall before they close it up. You may not ever see it again, but some lucky so-and-so will. Woohoo for the ground breaking studio!!! Good to hear from you!Your new home, how nice those words sound. Take a photo and send it to my email. Can't wait to see you new pastels! Hi Dale and thank you. I am thrilled as well! Hi Nika! Thanks about the painting! Good question..the main difference is when I underpaint in pastel it seems more drawn and later i decide how much I want to paint...with liquin. It also catches the surface grooves. I can't wait for my studio to be finished!!!!! Hey Sam, Great ideas. I will have to see tomorrow if I am too late to try them. It's all covered with a very large tarp.Love the time capsule idea! I have not stopped giggling to myself since mine was built in 1991! It is wonderful. I haven't been by for such a long time (been super busy) and finally stopped by to see what you're up to. This is a beautiful piece and I can feel the dew in my eyes. There is a place here in the Portland area that has mornings like this too. It's just beautiful in the early morning...and yes, it's a melon colored sky! Wow, a dream come true! 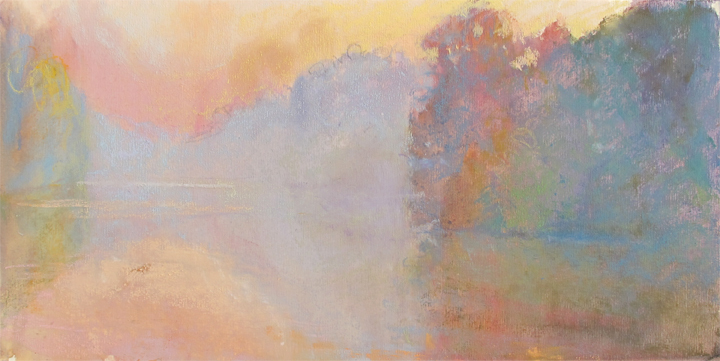 The quiet radiance of the 9 x1 8 pastel 7 watercolor-beautiful. Congratulations on your new studio! Thanks Marilyn! Sounds like I have a lot of smiling and giggling in my future. Busy is good. I will have to come by and see what you have been up to..exciting! Foggy mornings are my total excitement! Today it's raining so I am in the studio all day....there's always tomorrow for more melon skies. Thanks about the pastel...sometimes they work. Right now they are pouring cement for the slab in my studio. YAY!! I, too, love September mornings! Here, they're quite cool. A new studio!! So excited for you! A new studio! Just for you? That is super-exciting. Check this out--it's a blog about notebooks! Something poets and painters have in common. Hi Liz...just for me!!!! Can you believe it! I will definitely check out the link. Thanks! September mornings are so sweet. Do you have fog as well? Thanks about the studio. You always inspire me to look down different avenues with materials. I need to be more adventurous with my experiments. I agree that light and mist are irresistable to paint. The painting here really depicts both well. I love that moment when the sun just rises over the trees and floods them with light. Perfect. striving and as of yet not succeeding. Light and mist..aka the envelope is irresistible!And we keeping trying! fantastic news about the studio--- I am jealous....but in a good way! LOL...love this painting too. gorgeous! congrats on the studio! That's been my dream too, I am very very happy for you! 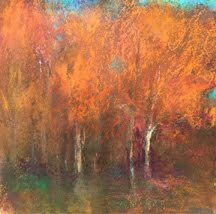 and beautiful work--I've used liquin/pastels too, I'm a liquin junky. I cant' wait to see the larger piece. best to you! Hi Sarah!Thanks about my new studio! I still can't believe it's true! Liquin is addictive I agree..often I try to end my addiction, no real luck yet. My last "ending" lasted 8 months, but I returned. oh dear! DO you try to leave?